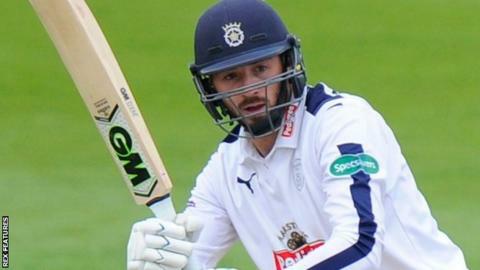 Hampshire built a strong first-innings total against Durham to boost their chances of Division One survival. The home side, eight points adrift of seventh-placed Warwickshire at the start of play, reached 370-6 after an uncontested toss at the Ageas Bowl. Captain James Vince (92) and Will Smith (90) led the way with support from Jimmy Adams (53) and Sean Ervine (50). All-rounder Liam Dawson finished unbeaten on 47 as Ryan Pringle was the pick of Durham's bowlers with 3-153. For the second successive season, Hampshire are bidding to survive relegation to Division Two, and know they are unlikely to do so if they fail to beat Durham who are already safe. The hosts need 30 more runs from 13 overs to take maximum batting points, but their fate also depends on the result of Warwickshire's game with Lancashire at Edgbaston - where the hosts were bowled out for 219 on day one. Read more: What are Hampshire's relegation permutations? Adams and ex-Durham skipper Smith got Hampshire off to a perfect start by putting on 111 for the first wicket before Adams fell three overs before lunch, playing on to Scott Borthwick. The hosts' progress continued after tea as they added 151 runs for the loss of Tom Alsop and Smith, with Vince and Smith sharing a third-wicket stand of 102. Vince raced to his half-century in just 48 balls and the Hampshire captain, dropped from England's Test squad to tour Bangladesh, appeared set for a second Championship century of the season before he was run out by England's Ben Stokes. Ervine then passed 50 for the fifth time in six innings and 1,000 County Championship runs for the season before he edged Pringle to Paul Collingwood. "I think it's a good day, we would've batted first as well. I think it's a wicket where it's probably not going to get any better. "We feel getting as many runs first up is a good thing, so 370 at the end of day one is good. We've scored a a decent rate, which is good for the bonus points. "If we can squeeze another 30 runs out in the next 13 overs, then we'll have done really well. "All we can do is try and get as many points out of this game. We'll do that and see what unfolds up at Edgbaston. "We're setting out to win this game and with four days of good weather, we can get into a good position to do that." "Paul Collingwood decided he wanted to bowl and with the overhead conditions early on, it was probably the right decision. "I think we were unlucky not to have them a couple down early on and it's a strange wicket as well. If we could have got them two or three down early, we could have made real inroads. "They pressed on and it looks pretty difficult to get in on, but it should be an interesting three days to come. "I was pretty expensive, but it's a learning curve with 30-odd overs in the day. They were pretty aggressive from ball one, but we were trying to take wickets all day."